Rashtriya Kishor Swasthya Karyakram, or the National Adolescent Health Strategy, is a framework for mobilising communities, healthcare providers, and educational institutions towards the betterment of adolescent welfare. It is an initiative undertaken jointly by the Ministry of Health and Family Welfare and the UNFPA. Art directed by Itu Chaudhuri and Richa Bhargava at ICD India. Content organisation Though the framework itself is complex and extensive, it can be easily broken down into four distinct components: the end goal; strategic priorities which support the goal; policies and interventions to fulfill these supporting objectives; and the alignment of these efforts for focused and efficient execution. These components are mapped onto what the text refers to as the "7 Cs". Data visualisation Easily understandable charts are a key feature of the handbook. These accomplish a two-fold purpose of facilitating comprehension and introducing visual incidents into a dense volume of text. 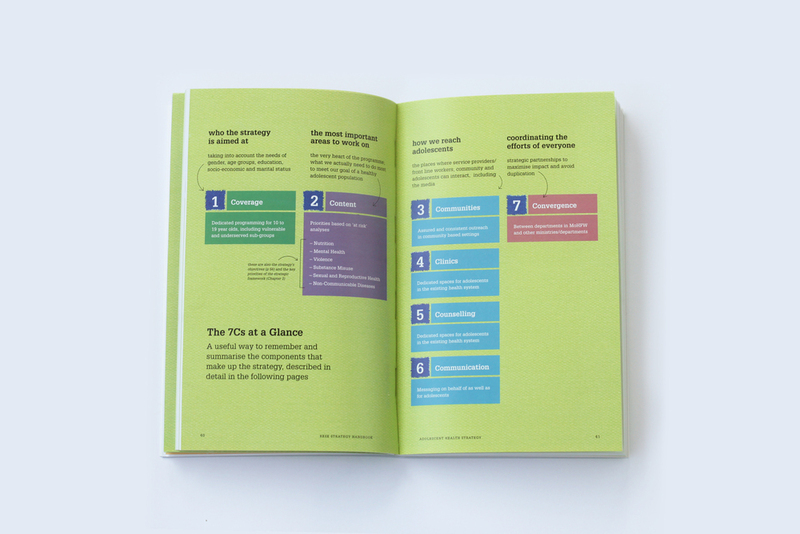 Visual Design Language The handbook incorporates an eclectic mix of fabrics; it is dressed like the young people it seeks to support. The unpolished charm of distressed fabric is complemented by a tempered and rational approach to typography. Following the theme of simplification, additional spreads were designed to highlight the underlying structure of the content.